This booklet on tea parties is one of the Miss Kyoto doll accessories. The paper booklet is block printed in polychrome and folded accordian style into four panels. The cover features a pagoda peeking out from a cluster of sakura (cherry blossoms) and the title: "Japanese Children and Dolls' Tea-Parties." Inside the booklet, Panel 1 (from left to right) features an illustration of girls in kimono at a tea ceremony, with the traditional implements (a hibachi, a bamboo hishaku, and so forth). 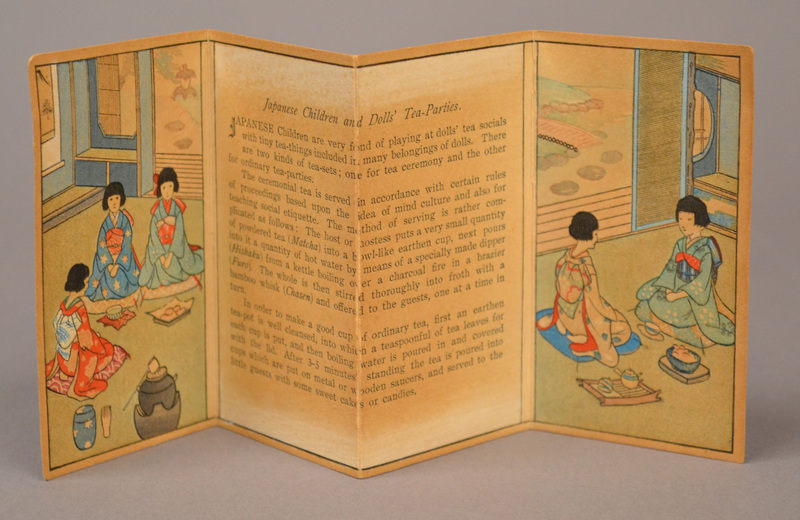 Panels 2 and 3 feature informational text in English about tea ceremonies and tea parties in Japan. Panel 4 features an illustration of girls in kimono at an informal tea party. On the back panels, the sakura pattern continues, and the back cover features Mt. 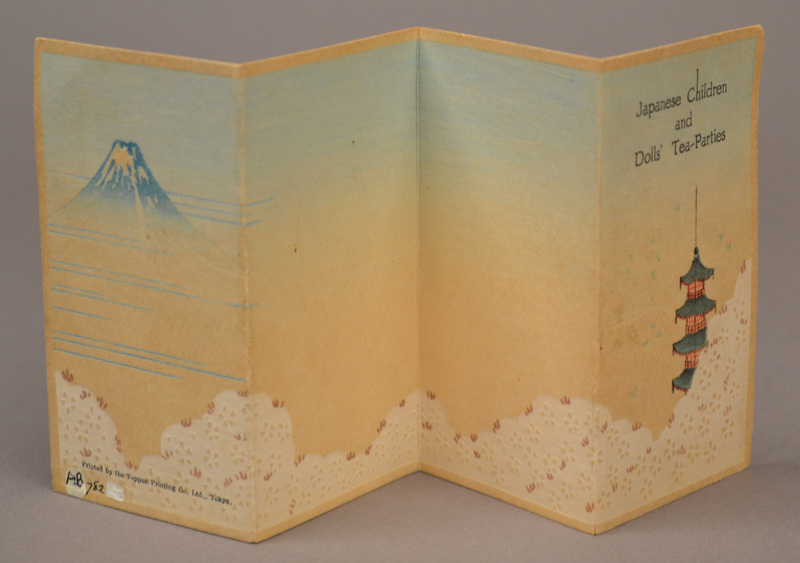 Fuji rising from the clouds (blue horizontal lines) above sakura and the text: "Printed by the Toppan Printing Co. Ltd. Tokyo." The tea ceremony is a tea-making ritual from Japan (practiced less frequently in China and Korea). At a very basic level, tea ceremonies are a formalized way of making a hot drink, through a process that has been refined to yield the best taste. 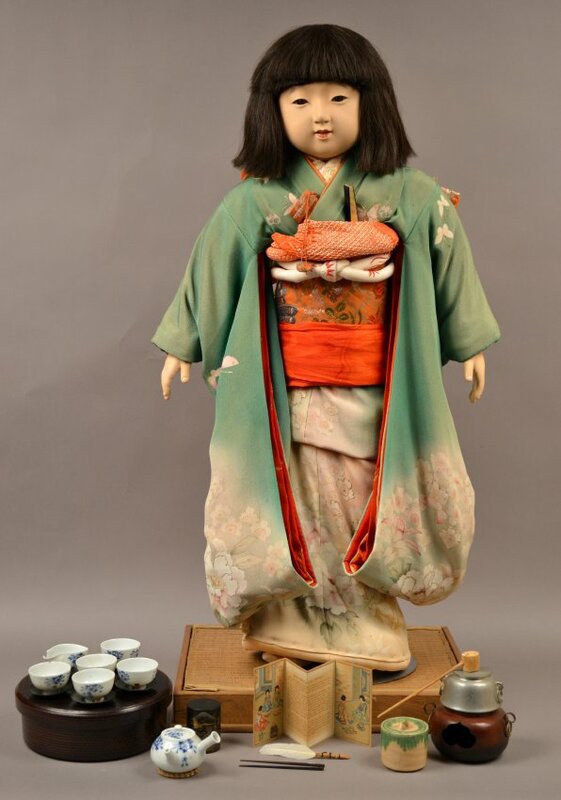 In Japanese, the tea ceremony is referred to as the "chado," literally "the Way of Tea," or "cha-no-yu" ("tea water"). In keeping with this Way of Tea, in the ceremony tea essentially becomes more than just a drink: the tea ceremony is understood and practiced to foster harmony in humanity and with nature, as well as to discipline the mind, quiet the heart, and attain the purity of enlightenment.